I define norms as expectations for both personal and collective behavior - these expectations are based on everything we've encountered and experienced in the past. Recently Seth Godin wrote about social norms and how they translate in the online world. His belief is that digital norms are still quite diverse and unpredictable because so little time has gone by since the Internet became popular - not nearly enough time for uniform behavior to be established. Godin is on the right track but he's understating the reality of change - since he assumes that widespread norms will be established at some point. I believe that the Internet offers such a unique platform for the development of new communication channels that nearly-universal social norms (such as handshakes) might never come about (or at least not in the foreseeable future). Taking the written word as an example, in 20 years we've gone from bulletin boards to email to chat to instant messenger to blogs to Twitter - with newer channels built on top of the old, never replacing, only adding further complexity. If you compare the simple actions of emailing an acquaintance vs. tweeting an original link/comment into the ether of acquaintances, I suspect that two fundamentally different sets of response-expectations play out. 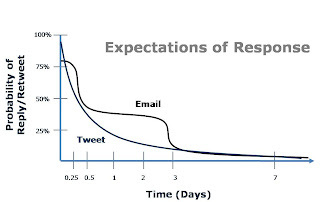 Once an email is sent, there is a longer high-probability response-period - with rapid declines after certain periods of time (correlated with email-responding hot-periods such as morning and evening). The world of Twitter moves at a much faster pace. A response is initially more probable (due to the one-to-many nature of Twitter) but quickly declines because of the fast-paced flow of new messages. The reality of Internet-enabled, rapidly evolving communication-channels forces us to constantly re-learn and re-socialize. This need to repeatedly re-establish norms has wide-scale implications for both individuals and companies. Adaptability and a fundamental comfort with change are required for successful communication.